There are many reasons why I love AQUA! I need waterproof, smudge proof, crease proof and long lasting makeup that stay and look like I just apply my makeup. Jeng jeng jeng… the answer to all my requirements is Make Up For Ever AQUA Collection. This summer Make Up For Ever added few more irresistible new makeup items into their star line AQUA such as Aqua Smoky Extravagant, Aqua Liners, Aqua Lip and Mist & Fix. This collection highlights the love for colours, passion for uniqueness and respect individual style. Should I say this is the era of limitless and freedom to play with makeup – girls you set your own rules and style. Bring it on! Last month I attended I love AQUA Pro Workshop at Make Up For Ever Pro Boutique in Sephora Starhill Gallery. Aqua products are essential to pro makeup artists and sports and entertainment figures – imagine what synchronized swimmers or ice skaters must have gone through without it or those performing under hot lights for hours – but also to women like us who want to apply our makeup in the morning and have it look just as flawless at the end of a long day. The AQUA collection is 100% waterproof, 100% smudge proof, 100% Crease Proof that make sure our makeup stays at it is after our workout. Well, we can use the AQUA makeup collection anytime and anywhere; during holidays, travelling, long days, parties and also most runways models using AQUA makeup because it long lasting, minimum or no touch up required and the colors are very sharp, prominent and intense. Aqua Smoky Extravagant is the secret weapons for irresistible eyes. To the mascara die-hard fans you should try it, makes your eye lash curls, thickens and intense black. This is waterproof mascara that gives a dramatic fanned-out impact, visible from afar with each lash being well-defined. The non-sticky and clumpy texture glides over our eye lashes with perfection. Its voluptuous shape makes for easy handling. The thick elastomer fibres of the brush are twisted so you can stretch the lashes while separating them from root to tip - for that special volumizing and lengthening effect. So there will not be any mascara smudging or smearing even after swimming. The sharp and intense Aqua Cream multi purposes cream eye shadow literally makes colours pop. The creamy texture makes it easy to glide and blend on eyelids or lips or cheeks or any part of the body. There are 26 colours available from pearly to illuminating. Its versatile creamy texture makes 8 of the shades perfect for lips and 6 other as blush. The Aqua Cream code is #23 Acidies Green. Nothing can excite me more than eyeliners! That is my most essential makeup items. For Summer 2014, Make Up For Ever launched 4 new Aqua Liners diamond-shimmer colors - #02 Diamond Black, #17 Diamond Grey, #18 Diamond Blue and #19 Diamond Pearly Pink. It’s the ideal ally for high-precision doe-eyes; the foam-tip applicator makes it easy for you to draw a smooth, perfect line as it follows every curve of your eyelids. The Aqua Lip 5 new shades that gives sherbet tinted lips - @21C Cool Candy Pink, #22C Tender Pink, #23C Apricot Pink, #24C Vintage Coral and #25C Orange Red. The Aqua Lip kiss stays perfectly synced with the Aqua Rouge ultra long wearing waterproof lipstick shades. Its precise tip hugs the contour of the lips to correct or intensify the look depending on the desired effect. Its smooth, creamy texture never dries out the lips and stays perfect for hours on end. Available in 20 shades. Aqua Rouge is highly pigment concentration for long lasting and waterproof effect. It has 2 sides, one is the clear for super glossy look and the other side is the color that gives velvety matte high coverage. The new #03 Light Rosewood shades is the 18th colour in this popular lip colour line. This is not an ordinary mist! Make Up For Ever Mist & Fix is a long-lasting make-up setting spray that keeps the skin healthy. Shh… this is one of the best-kept secrets of make-up professionals. It works wonders and its light plus comfortable. During the Pro Workshop, Jason Ooi, Make Up For Ever Trainer did a test and demo to show us the magic of Mist & Fix. Firstly spray the Mist & Fix after makeup and then use a dry clean cloth to dab on the makeup area. The white cloth is clean without any traces of makeup. This proof the Mist & Fix seals and improves the holding power of make-up while moisturizing the skin. O2 Skin Complex technology is enriched with nasturtium extract to improve oxygenation of the skin cells for radiant skin. Its alcohol-free formula revolutionizes product performance, combining flawless holding power with a moisturized, glowing complexion. This is a must have! If You do not believe me you can head over to Sephora to try it out. So do you love Aqua? 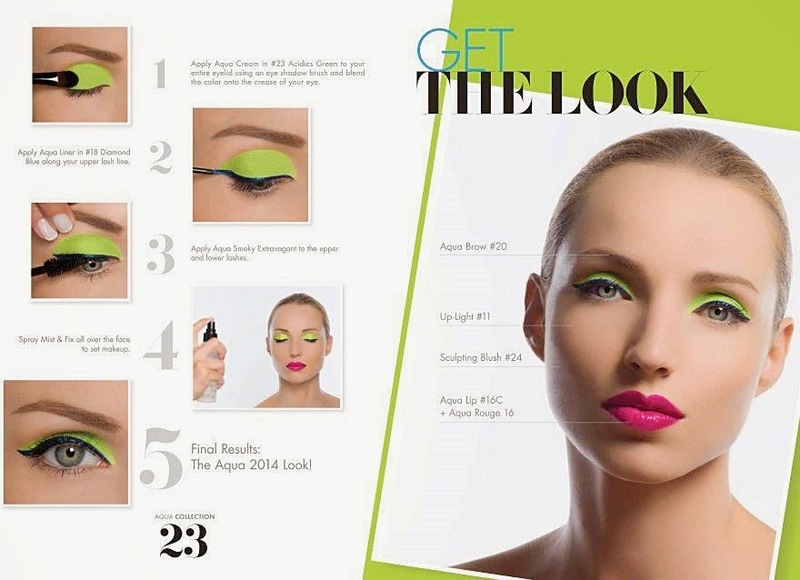 Make Up For Ever Aqua Collection 2014 is totally a rescue in our hot and humid country. We tend to sweat more and most of us tend to have oily or combination skin so the Aqua Collection can help our makeup to stay and look good from day to night regardless of what we do. Everything has to deliver the same perfect results as anything else we put our name to. Dense pigmentation, smooth application, our usual extensive range of shades and effects, and always, always, an impeccable finished look.